Warhammer 40,000: Dawn of War 3 was announced to come out on 27th April this year. Not only that but the several pre-order editions also announced. The RTS will have three different edition: Collector’s, Limited, and Standard Edition. 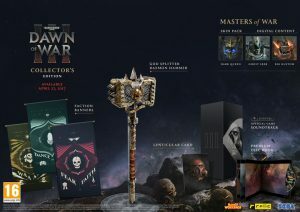 The Collector’s Edition includes a premium disc book, an art card, the official soundtrack, a replica of the Godsplitter Daemon Hammer, three mounted cloth faction banners and the Masters of War Skin Pack.